Juju had a bit of a history. After he was first primed, he sat in the rain for three days before he was rescued. 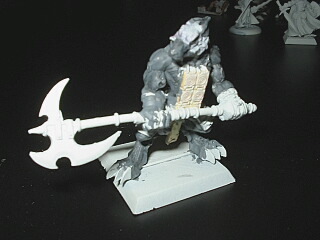 A good Samaritan tried to salvage the ruined primed surface by giving him another coat. Somehow he ended up being primed a third time, and I started a gray basecoat before realizing that it was wasted effort and tossed him in the stripper. As he stands in this image, Juju has just come from three months in a Pine-Sol bath. Pine-Sol and the many other chemical mediums used for stripping have not been successful for me. 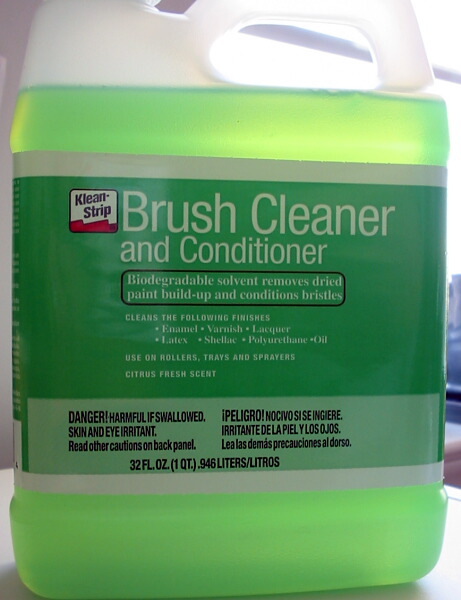 By chance, I stumbled on “Klean-Strip Brush Cleaner and Conditioner”, which I purchased in Home Depot for slightly less than $6. The product is advertised as being completely biodegradable and gentle on everything except paint. You cannot miss it – The bottle is neon green. I was surprised with how well Klean-Strip performed on a handful of miniatures I chucked into a jar with some paintbrushes. After three days soaking, the paint was gone from all but the recessed cracks. After a week, all paint was completely gone. I then set out to try and find out if Klean-Strip had limits of use. Mason jars filled with minis were scattered across my deck. The following image shows the unwitting test subjects before the stripping began. 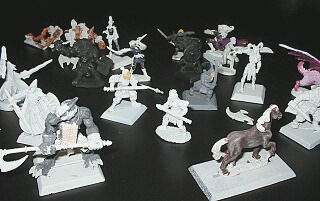 In this shot are Reaper, recent D&D, Rackham, and Clan Wars figures. 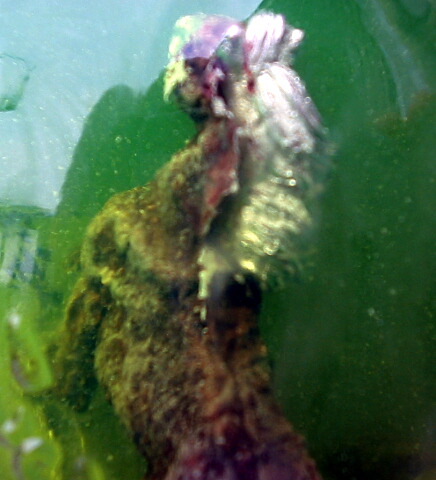 This is a close-up shot of the neck a Clan Wars horse. You can see how Klean-Strip removes the paint in what appears to be a single sheet of acrylic. 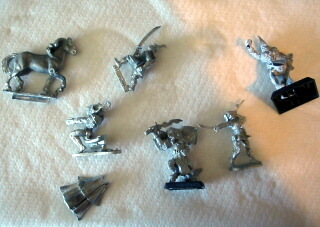 After one week in the bath, the figures are almost perfectly clean. 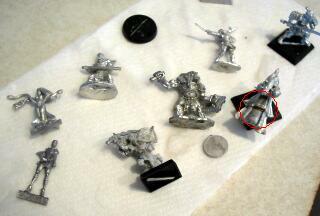 The only trace paint is on the back of the D&D wizard’s cloak (see circled area). The "blue" in the figure in the far right is a trick of the light. Then I put the jars away for three weeks – When the minis emerged to see the light of day, there was no trace of paint and the Crazy Glue bonds had broken on all figures. - Minis left to soak in Klean-Strip for two or three hours seem to be stripped as easily as minis left in the solution for a week or more, save for extremely deep crevices. - Plastic bases did not seem to be changed or harmed by three weeks in the Klean-Strip solution. - Using a toothbrush to clean the solution from the figures after the Klean-Strip bath seemed to promote the darkening of the figure, even if the paint was completely removed. One final note on Klean-Strip is that it appears to be reusable over brief periods. I was able to exchange figures and have them come out as clean as if the solution was fresh. 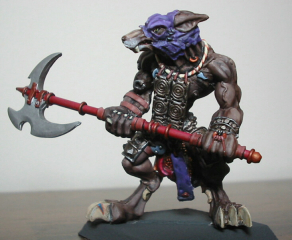 Next – But Can They Be Painted? But Can They Be Painted? Juju was painted with Vallejos over a coat of clear primer. I currently am working on another ex-Klean-Strip victim that is Vallejos over white primer, and the paint sticks to her without a problem. I would like to note that there has to be a dark side to Klean-Strip, as it ate a foam brush down to the wooden stem. This suggests that there is a limit on the time a figure can safely be left in the solution, although the figures that are still sitting in Klean-Strip nearly 6 weeks after I started this project seem none the worse for wear. The company advertises Klean-Strip as "biodegradable" and safe to use, but also clearly notes that "Using this product will expose you to chemicals which are known to cause birth defects or other reproductive harm," along with a happy litany of other problems that can result. Still, I suppose it's just part of living in modern society, and it's probably not much worse than the paint itself. I've also just been disposing of it by pouring it down the drain - Perhaps not the most environmentally-friendly solution, but I don't know of an alternative for solvents avalable in my area. I could not find a distributor for Klean-Strip in the United Kingdom, but here is the URL for the manufacturer and its product listing. The folks at Home Depot say that it is increasing in popularity, and hopefully any local hardware stores abroad will be able to help get it into the store. I don't know about prohibitions on international shipping, however, but contacting the company directly might be an option. i too live in the UK. one thing puzzles me. WHY has NOBODY marketed a mini-stripping agent?? Does this not baffle anyone?